I LOVED this book! It is funny, poignant, authentic and highly readable. The author is a travel writer who has travelled extensively all over the world. Iran comes alive under her pen. The title caught my eye when a friend recommended the book. 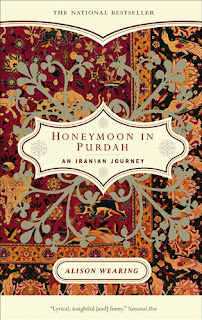 Why take a honeymoon in Iran, I wondered? The reader quickly finds out that the author and her gay friend are not married. Alison Wearing wanted to travel to and write about Iran (I have come to this place because it frightens me, because it frightens the world. And because I don’t believe in fear. In giving it such power) but could not do so as a lone woman in a Moslem society. Therefore an “arrangement” was entered into, with her male friend, complete with a false marriage license. Once in Iran they tell everyone they are on their honeymoon. What is purdah? One definition is “a state of seclusion or concealment.” The author makes a poignant observation of a group of women in Iran about to engage in one of their five daily prayers: “Lida takes my hand and leads me behind a curtain. Into purdah. Where pools of black cloth soak the ground. She joins the mass of chadored (a chador is a large cloth (read tent) worn as a combination head covering, veil and shawl, usually made of black polyester) women in the comfort of ritual and I sit to the side, watching her hide her shameful body from the eyes of God.” Powerful, isn’t it? The author never stepped out into public view, despite searing heat, without the chador covering her completely, thus giving her seclusion, concealment, anonymity. The author obviously has great affection for the people who are portrayed as generous, kind, and warm-hearted. Strangers constantly offer Wearing and her “husband” food, water, pipi zam zam (or Coke as it is known in Iran). Without being asked, people pick up their luggage and carry it for them. They are invited to numerous private homes for meals. While in Iran the author travels by bus and food is passed to her from many fellow travelers. Iranians have a custom of putting their hand over their hearts and bowing to people – a very endearing gesture that carries various meanings -sometimes thank you, sometimes reverence, always respect. Alison Wearing has an amazing talent for description. “The air is cool and smells of rested flowers. Palm trees outside our room are scrubbed by pale light. There is the sound of plants yawning, of insects chattering their teeth against leaves, of heat settling onto yesterday’s footprints. It is a day in which the earth will dance.” This is one of many delightful descriptions in the book. The reader gets some insight into life in Iran. It is better since the revolution that deposed the Shah but worse as far as individual liberties, particularly as it concerns women. At the time of writing in 2000 the unease felt by many Iranians is brought into focus by describing the caution with which families leave their homes, always with their wives and daughters well covered. She describes a scene where a woman is punched by her husband in view of many people and she intervenes to help the wife. It’s worth reading about the divergent views of Iranians versus Westerners regarding the treatment of women. This is a wonderful, descriptive account of Alison Wearing’s journey in Iran. It is hugely amusing and intriguing account, on many levels, of contemporary Iranian life. Read it to be informed. Disclosure: I borrowed this book from the library and was not compensated in any other way, nor told how to rate or review this book. The author will be in Montreal this Fall, so now I really want to read this book! I'm sure her author event will be soooo interesting. I love to read about other cultures, so this book sounds right up my alley. This sounds very interesting. We don't read much about Iran in books at all. I love how the author said, "I have come to this place because it frightens me, because it frightens the world. And because I don’t believe in fear. In giving it such power." Someone just alerted me to this post and I'd like to offer many warm thanks (with a hand over my heart) for such a lovely review! I'm both honoured and humbled by such kind words. I look forward to reading (and performing my new book as a one-woman show) in Montreal in the fall. Perhaps we'll meet? Alison, both Sandra and I would LOVE to meet you along with our book club members! When are you coming and where? Is it at the Jewish Public Library? Hi Laura -- It would be lovely to meet you and your book club members. I'm not sure where the Montreal event is being held. It is being hosted by the Cummings Centre on 24 Oct, but I believe it will be in a nearby theatre. If you send me an email address, I can let you know. Alison, I will contact you through your website. Thanks! Sandra, I am thrilled you enjoyed the book! I felt the same way when I read it, only you describe it so beautifully that hopefully it will inspire others to read this enlightening story.